Nokia brand smartphone maker HMD Global today launched the Nokia 8110 4G ‘Banana’ phone in India. This phone comes with slider mechanisms. This Nokia phone comes with a slide-to-end and slide-to-cancel feature. Like the Jio Phone, the Nokia 8110 4G phone also runs on Kai OS. WhatsApp, YouTube, and other Google apps can be easily accessed on the Kai operating system. 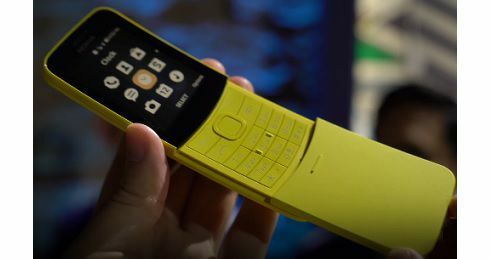 The first glimpse of the Nokia 8810 4G feature phone was seen in the Mobile World Congress 2018. From October 24, phones will be purchased offline and online from Nokia Partner Retailer. Nokia 8110 4G has a price of Rs 5,999 in India, making this handset will be sold in yellow and black color. Recall that during the MWC 2018, the phone was launched at 79 Euros (about 6,800 rupees). The phone has 512 MB RAM with 1.1 GHz dual-core Qualcomm Snapdragon 205 chipset. Inbuilt Storage is 4 GB, MicroSD card slot is not present for storage. The battery of 1,500 mAh will work in the phone. The smartphone has a 2-megapixel rear camera with LED flash. The camera is not given on the front panel for selfies. It has a 2.45-inch QVGA (240×320 pixels) curved screen display. Making dual-sim (micro + nano) Nokia 8110 4G phone will run on KaiOS. The smartphone features 4G VoLTE, Wi-Fi 802.11b / g / n, Bluetooth 4.1, GPS / A-GPS, FM radio, Micro-USB port and 3.5mm headphone jack connectivity features. The phone is equipped with IP 52 drip protection. The dimensions of the handset are 133.45×49.3×14.9 millimeters and its weight is 117 grams.